*I received a copy of this movie in exchange for my honest review. All opinions expressed are 100% honest and my own. I always look forward to new Disneynature films. These films give you an inside look at a world that many of us have never experienced before. 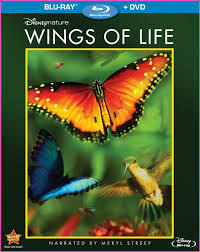 The newest Disneynature film that is set to be released onto Blu-ray and DVD April 16th, is Wings of Life. This movie is narrated by Meryl Streep and is stunning. Below is a short clip with just a taste of what you will see. Disneynature is the same studio that brought to life the movies African Cats, Earth, Oceans and one of my favorites Chimpanzee. So if you have had the chance to see any of these movies, then you know what a treat you are in store for with Wings of Life. The movie is directed by Louie Schwartzbarg and uses high-speed, and closer-than close film making skills to showcase the beauty and stunning detail of these amazing creatures on our planet. Some of the winged animals that you will encounter throughout the movie include, butterflies, hummingbirds, bees, and bats. This is not only a spectacular film for adults to watch but it’s a great family film that will definitely spark an interest for little ones. My two kids can’t get enough of these Disneynature films and Wings of Life was probably one of their favorites. We often sit on our deck in the mornings before school and watch the hummingbirds so it was really neat to be able to see them extra close through this film. Disneynature Wings of Life will be available on Blu-ray and DVD April, 16th just in time to celebrate Earth Day so be sure to grab yourself a copy of the movie. For more information on this movie you can visit Disneynature.com. Pretty! Would love to see this. looks like a great movie I can’t wait to check out! It’s a beautiful, beautiful movie! I couldn’t look away. My kids love disneynature videos! My daughter will love this one! I bet that is going to be neat to watch. My son would love this! Thanks for sharing! I can’t wait to pick this up! Looks like a great movie for the whole family!